Today's saint seems to be incredibly popular amongst my friends and family, so I can't let it go by without sharing a pair of churches dedicated to Saint Nicholas, who is of course the origin of the popular folk hero Santa Claus of whom we see so much of this time of year. 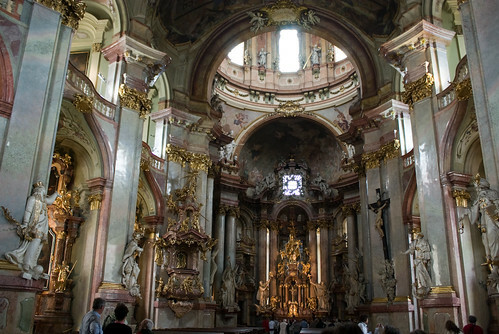 First we have two exquisitely Baroque churches in Prague. 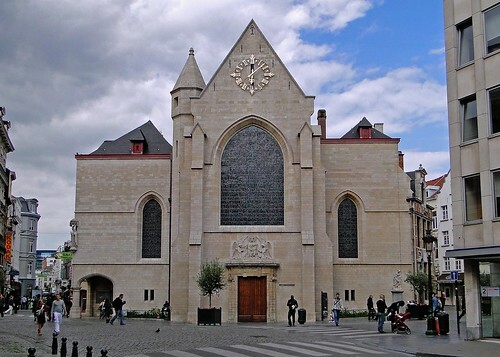 There are three churches in the city with this dedication, two of which are the work of the same architect, Kilián Ignác Dientzenhofer. The first is the exterior of the church in the Old Town Square, the second the interior of the one in the Malá Strana or Lesser Town. And for contrast, here is some excitingly beautiful 12th century asymmetry from Brussels.